This set of 9 photos was taken on a trip to the highest point in West Virginia, Spruce Knob, and the route down, over the weekend of May 27 -28 (or was it earlier? My memory is slipping). At the moment, I'm working on a topo map of the hike route, but until then: this is a 1:100,000 map of the area and a 1:25,000 (a) and another 1:25,000 (b). Go here for one page with interesting information about the region. 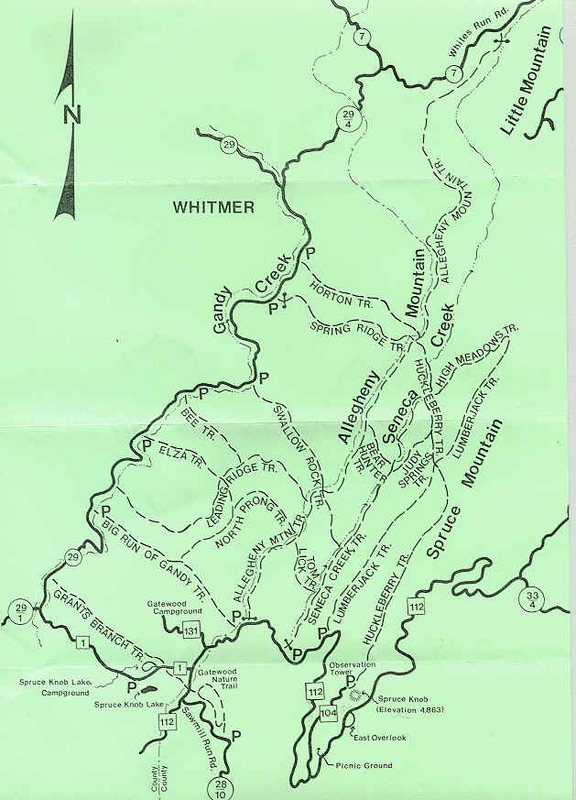 Lastly, this is a map of the trails of Spruce Knob. We took the Huckleberry trail to the Lumberjack and High Meadows trails (Dianet, Christine, Grendel and Nat), and to the Judy Springs trail via an unmarked, unmapped fenceline (Barf, Me, Mickey and Amy). The next day, we took the Seneca Creek trail from our campsite well downstream from the Judy Springs campground to the Bear Hunter trail, along the Allegheny Mtn trail, down the Swallow Rock trail and back onto the Seneca Creek trail to the second car (the other was on top of Spruce Knob, where we began). Oh, and Spruce Knob lies within the Monongahela National Forest. I wasn't the only one taking photos. We had four shooters, but Amy B. and Christine were the only other ones to give me photos to put up here (left and right). All photos in this site, except where specified, © 2000 (earlier where specified) tjd, all rights reserved.Written permission must be granted for any use of my personal photographs, please! I am a struggling artist and need all the help I can get!